As Music Educators, it is our mission to inspire and guide every student in active music making through the use of a sequential and creative curriculum that nurtures the human spirit and promotes cultural understanding. 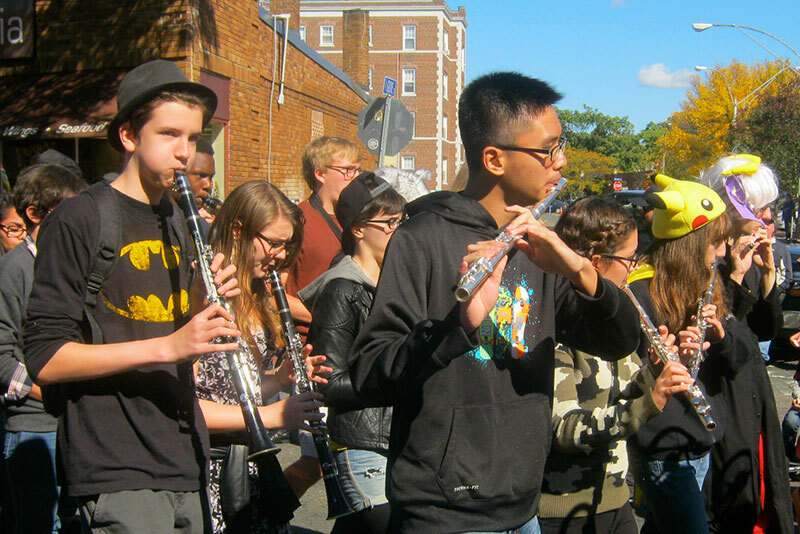 Read our Music Learning Objectives for grades Pre-Kindergarten through 6th grade.Somerville students engage with the larger music community through events like Grooversity and HONKFest! If you have questions about the Music Program, please contact the Music Director Rick Saunders. Visit the Theatre webpage to learn more about Theatre Arts in Somerville Public Schools. Somerville Public Schools offers FREE instrument instruction in applicable grades. Visit the Instrument Instruction page to learn about the programs.Students participating in the free instrument instruction who need to rent an instrument may do so during our annual rental event. If students miss this opportunity, they may also rent on-line. Students whose families meet income requirements, may rent an instrument owned by the school district at reduced cost. Instrument Events. Rent an Instrument (for families who do not qualify for Free or Reduced Lunch) on September 11, 2018 from 3-8pm at Somerville High School. Borrow an Instrument (for families who qualify for Free or Reduced Lunch) on September 13, 2018 from 3-8pm at Somerville High School. Band and Strings Rental Company: www.needhammusicanddance.com. Strings Rental Company: www.acousticstrings.biz. Students in grades 6-8 may join several city-wide music groups by invitation. These include the All City Middle School Chorus led by Ms. Beverly Mosby, All City Middle School Band led by Ms. Rosemary Sears, All City Middle School Orchestra led by Mr. Andy Blickenderfer, and All City Marimba Band led my Mr. Adam Epstein. For students from Elementary School through Middle grades throughout the district. The East Somerville Community School hosts the innovative El Sistema Afterschool Strings Program. Please visit the webpage to learn more. Classes include Band, Jazz Band, Chorus, String Orchestra, Drum Line, World Percussion Ensemble, Special Music, Musical Theater, Show Choir, Piano Lab, Music Technology Lab, Music Theory, Introduction to Guitar, Guitar Lab, and Advanced Guitar Ensemble.